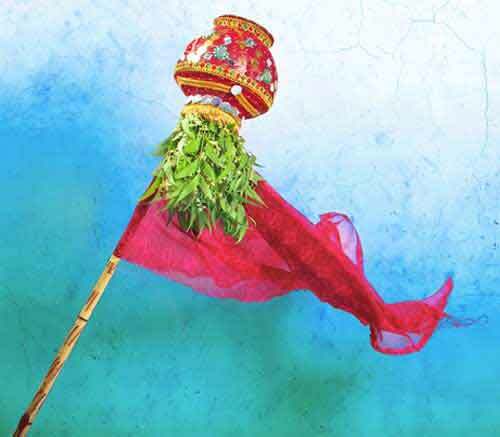 How to make Gudi Flag for Gudi Padwa? Gudi Flag is raised on the Maharashtrian New Year Day and it is known as Brahmadwaj. Raising the Gudi Flag on the early morning hours of Gudi Padwa marks the beginning of the Marathi New Year. It is observed on the first day of Chaitra month (March – April) in the lunar calendar followed in Maharashtra. How to make Gudi Flag? The Gudi is made of neem leaves, gaathis (Sweet made of jaggery), a copper pot, a piece of cloth and a long wooden stick. A 5 to 10 feet long bamboo or any other wooden stick is taken and cleaned and a piece of silk or cotton cloth is tied at one end of the stick like a flag. A copper or silver or steel or brass pot is placed on top of the Gudi. A garland of flowers is placed on the top and is decorated with neem leaves. Some people tie jaggery sweet on the pole. In some regions sugarcanes are placed around the pot. Why is a Gudi Raised on Marathi New Year?